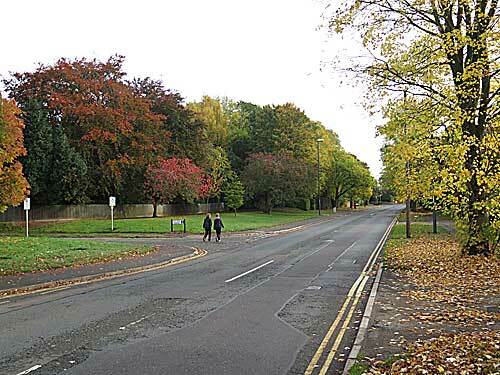 Littleover village is part of the large suburb of Derby bearing the same name. The village, as it is known, is the shopping area on the Derby to Burton road, approximately 2 miles south west of Derby. There is a wide variety of shops and services in the village, including a Kwik Save, Iceland, garage, 2 butchers, and two pubs called the Half Moon and thw White Swan. As industrialization took place,the more affluent members of society wished to escape the over crowding in Derby, and Littleover as well as Mickleover, proved an ideal place to move to. The Derby Corporation Act of 1890, added a part of the Parish of Littleover to that of St Werburgh`s in Derby. A further Act of 1927 saw more of Littleover and parts of Mickleover incorporated into the Borough of Derby, and finally the villages were taken in 1968, despite their struggle to remain independent. Until the construction of Manor Road and Warwick Avenue, fields seperated Littleover completely from Derby. 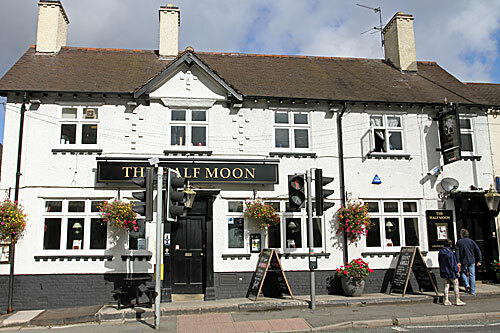 The Half Moon pub is recorded as being one of 2 inns in the village in 1577. It had began life as a farm and alehouse and in the 18th century served as a coaching Inn, the stables of which still survive. 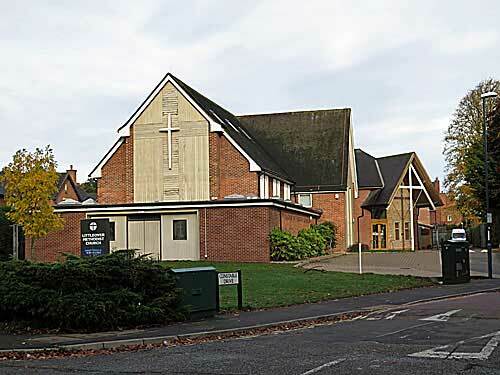 The main point of interest is the Church of St Peter, set back about 400 yards from the village main street. It contains a Norman doorway and font, and has 14th century windows in the chancel and south aisle. A 17th century memorial depicts Sir Richard Harpur and his wife and children, kneeling and facing each other at a prayer desk. It also contains a 17th century chalice. The church was heavily restored in the 19th century. The north aisle was restored in 1856 and in 1872 the north organ chamber and vestry were built, the chancel floor tiled and the choir stalls erected. Around the same time the reedos was placed below the east window by the wife of the Rev Buckwell who was the first vicar of Littleover after its independence. The south aisle was restored in 1908 and the west end enlarged in 1959-61. The church had a single bell which use to toll to announce the death of a villager. One toll for a man, two tolls for a woman. Opposite the church is a very popular pub, the White Swan. For centuries this area was the centre of Littleover, a square where fairs, feasts and markets were held, proclamations declared and where dancing and revelry would take place on public holidays such as Plough Monday and St Peters Day. In The Hollow can be found one of Littleover's oldest buildings, a thatched cottage of unknown date but which probably began life as a labourer's cottage on the Harpur Estate during the 16th century. Also here, can be found an ancient stone trough, a reminder from the days when the horse played a vital role in both farming and travel. The Harpur`s were an influencial family that lived in the hall, built by Sir Richard Harpur in the late 16th century, that once stood in the grounds of the headquarters of the County Fire Brigade, on Burton Road. The old hall was demolished in 1891 and rebuilt by an Edward Mcinnes whose family lived in it till after the first world war. It belonged to Rolls Royce during the 1950`s and 60`s and resold in 1971 to the fire service. Chain Lane was formerly known as Mill Lane after the ancient windmill which stood on the site of the Crest Hotel which was built around 1890 and bought by Offilers Brewery who opened it as an hotel in 1951. The building was destroyed by fire in 2002. Across the road from the hotel is Derby High School, which moved here from it's former home in Osmaston Street in 1957. In part of it's grounds use to stand a curious old mansion known as The Knoll. The roundabout here was, between 1934 and 1964, the place where Derby Corporation Trolley buses turned. Littleover represents a local community atmosphere, with a friendly and polite array of cultures, old and young. Recreational activities are also available with various tennis, cricket and football pitches located in various areas for you to use, such as St George's Playing Fields. Recent years, Littleover has seen a huge development within education, specifically through the introduction of the new further education facility, The Millennium Centre. Based on the campuses of Derby Moor Community School, in Moorway Lane, and Littleover Community School, in Pastures Hill, the centre has become extremely popular, reporting an increasing demand for places and attracting budding students from the whole Derby area. The area provides for the younger generation with many primary and infant schools located within the perimeter, with Carlisle and Ridgeway infants, and St Peter's and Gayton primary schools in close proximity. Additionally the location has seen some recent developments which include new housing and services within Heatherton Village, and many new shops and services within Littleover village itself.